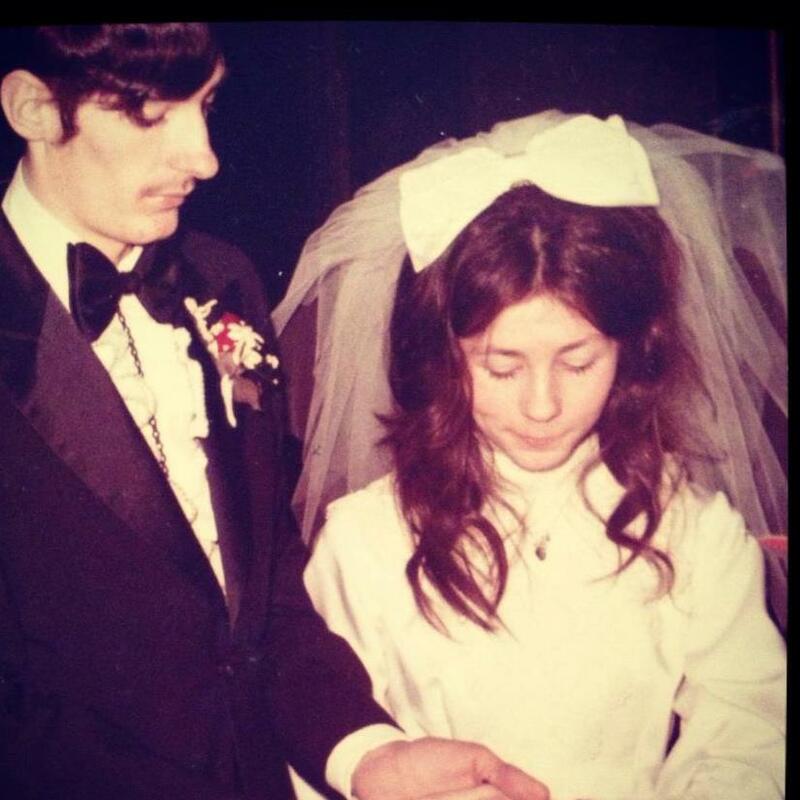 My mom and dad on their wedding day 41 years ago. We dated for a year and a half. Then we got hitched. I always thought I would be with someone 5-15 years before saying the formal “yes.” But this marriage thing just seemed right. But honestly, previously, I did doubt the construct. How good or how difficult would wedlock be? Was it worth it? Well, marriage, I have to tell you, is the bee’s knees. The fella and I just completed our first 365 days of it and it sure proved its worth. 365 days = About once a month this year we had a true “honeymoon” moment when we felt nothing but the love we have for one another. Plus there were the 33 major holidays/birthdays and days of travel/excursion when we fell in love even deeper and realized it, acknowledged it, indulged it. Approximately 4.75 days this year had muttered cursing, tears, exasperated exhales through the nose, as we two addressed issues head-on regarding faith, couches, umbrellas, and Facebook privacy. The other 315 or so days of this first year of marriage were busy with good living both independently and in partnership. I love the fact that, together, we can do so much more good in the world. 365 total, and can’t wait for the next. 2 years. We have never stopped talking. Married to my best friend. He makes the mundane an adventure. I’d rather stay home than go out because there is no one else is rather spend time with. He doesn’t care that I hide romance novels behind the bed. 2.5 years. Feels settled and stable. I like that. 3 years. It’s strange, but I love the freedom of being married. I am more free to be myself than when I was single. I feel more emancipated as a woman. I can take on the world. Will be 8 years in 10 days. What isn’t there to like? Married life is amazing if you have found your soulmate/best friend. 10 years. We are best friends who can have terrible fights and know it’s ok! We have fun in small moments unique to us. And we are “family” in every sense of the word. 10.5 years. Knowing that no matter what happens we have each other. We challenge each other and support each other in every way. We finish each other’s sentences and yet after knowing him for over 13 years, I found out tonight that he also likes cotton candy! 11 years. Laughter; at ourselves and with each other! Encouragement; of each other as individuals and as a team reaching for our agreed upon goals. Growth; individually and together through constant communication which really looks more like daydreaming about the future. I tell others all the time that marriage is work. It’s not hard work, it’s just constant work. And learn early on that you can agree to disagree, then arguments aren’t really arguments. 11 1/2 years. 2 kids. We balance each other, provide strength to each other, love each other unconditionally. We are able to laugh at our mistakes. We use each other’s strengths to find solutions instead of focusing on the problem. We don’t argue, we discuss when we are in disagreement. Are there things that drive us crazy about the other? Of course. But we are able to look past those things because we both realize that they are small in the scheme of things. We are united in our belief of what is most important-the health and happiness of our family. We are both willing to make sacrifices when needed-both for the other, and for the family. Will be 13 years this August. Comfortable, accepting, frustrating, liberating, everything wrapped up into one package. There will always be bad times but he can make me laugh more than anyone! 13 years this past October. What is the best? Being able to spend everyday either with my best friend, or at least get to talk to him. He knows how to make me laugh, how to comfort, how to just be there when needed. 14 years come May. I love the partnership, the companionship, the us against the world mentality. 15 years. That the only constant is everything changes but so long as you are committed to each other there is nothing you can’t handle together. And that whole unconditional love thing that you discover with the kids. 20 years in October 2015. I like the snuggling in bed at night. 39 years. The minute I meet him I knew I was going to marry him. We have worked together every day, we have spent more time together than most married couples. (farmers). Knowing someone is there when you need them, someone to play with, someone to cry with. I’m not saying there haven’t been days I would like some alone time or angry with him, they were few and far between. We are now entering a new phase, retirement, it should be interesting. Laughter. For 41 years we have been best friends and been there for all the ups and downs. My family pulled me up from the dark times in my life.